Recently a new Kindle book promotion service has come to my attention. Buck Books promotes free and 99 cent books that are on Kindle. How is this a free coaching resource? Two ways, first you can subscribe for free to their email broadcast. Second, you can ask them to promote your book to their list. If selected, there is no charge for this, at this time. 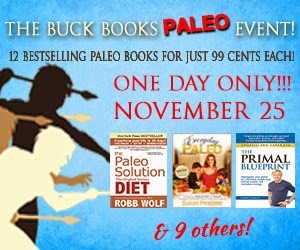 On November 25, they are having a special Paleo event to promote 12 of the best Paleo books on the Kindle Digital Publishing platform. This event is also free. They will send you the broadcast of the books on sale that day, and if you choose, you can select to purchase at the sale price. Buck Books also promotes free Kindle books. On Black Friday, they will have a Freebie Friday promotion that will promote only free books on Amazon KDP. I have been subscribed now for almost a month, and I have to say these are great people doing a great job promoting Amazon Kindle books and helping authors at the same time. Don't miss out on the Paleo Event, though. This is something they have worked very hard on and it is shaping up to be lots of fun. You can tell they are having lots of fun. What is branding? Or, better yet, do you need to be concerned with it? Your brand is basically what people know you by. If you are a coach, your online brand is how people will find you online. Whether it's your own name, the name of your coaching program, your "secret sauce" title, or anything else that describes what you do; your brand is important. Your brand, if properly utilized can put your coaching practice over the top. I was recently on a call with Bart Baggett's Marketing Mastermind, and his special guest was Michelle Villalobos. Michelle has a coaching practice that cannot be described in just one word or phrase. She teaches professional speaking, branding, how to have great headshots, and several other categories that can help you rise to the top of the stack in your niche. Right now, she is offering her report on owning your online brand. Her site for this is called Googleicious. (http://googleicious.me/) This is an excellent report that gives you a 4 week plan that can revolutionize your online brand. Her report gives you the foundation that starts off with the right steps and carries you through the process. She starts by showing you how to establish your baseline. Then, how to get the best headshot. Michelle also gives very important tips on how to build your email list and find your tribe. She closes with the long term strategy that helps you carry on the momentum that your have built over the last 3 weeks. This is one of the best free coaching resources that we have been privy to this year. Make sure to download this report and utilize the steps to become the coach that you are meant to be. Also, we will be unveiling some major news at 100 Coaching Tips very soon. If you have not already downloaded the free coaching tools and resources yet, please do so. This year is fast coming to an end. Let's make it a great year. What are you struggling with in your coaching business? If you have been working to grow your coaching business for a while now and things aren’t happening as fast as you want, then I’d like to help you create a MAJOR coaching business Breakthrough. Here’s the scoop……. · Create a crystal-clear vision for your “Ultimate Coaching Business Success” and the “perfect lifestyle” you would like your coaching practice to provide for you and your family. · Uncover the hidden challenges that may be sabotaging your coaching business and keeping you working too many hours with no results. 1. How long if you had your coaching practice? 3. What your revenue goals for the next 12 months? 4. How many clients you presently have? 5. What do you see as the major challenges holding you and your coaching practice back from growing at the pace you want? 6. On a scale of 1 – 10, how important is it for you to overcome your challenges and achieve your goals today? Since were making this offer for the first time right now and we don’t know how intense the response will be, we cannot guarantee a strategy session for everyone. We will take as many people as we can and then start a waiting list. You can expect to get contacted by our team to schedule your session within the next three business days. The actual strategy sessions will take place between July 9 and 14. If you don’t hear from us, it means we have received more question we can handle right now and if something opens up, we will get in touch with you at a later time. Again, to take advantage of this offer, simply click reply an answer the questions listed above. Also, please have a safe and happy Fourth of July! We strive to bring you the best free coaching resources on the web today. Copyright 2013 100 Coaching Tips. Simple theme. Powered by Blogger.